Hey folks, I’ve been hard at work getting my newest cosplay together and I wanted to show you all how that’s coming along! You’ve already seen the beginning stages of him, but Frog is nearly done at this point, with the exception of a few details. The most major thing you all haven’t seen yet are Frog’s sword and shield. The shield is actually a plastic Captain America sheild I ordered online. It was a bit bigger than I needed it to be so I cut off the outside layer of the bullseye. I also came up with a lotus emblem (seemed appropriate for a pond-dwelling amphibian), since you never actually see the front of his shield in any of the official artwork. I also used thin vinyl tubing around the outside to give it a nice edge. I sliced along the tube so it fit around the edge of the plastic sheild. It’s not the easiest to see in this photo since the tubing is transparent, but in the painted photo you’ll be able to see a little better. The sword is all made from 1/2” MDF board and is quite sturdy, and a bit hefty, but I really like the feel and weight of it. Thankfully I’ll have it in a scabbard most of the time to the weight shouldn’t be an issue at conventions. Here’s the full sword build, with almost all it’s details (except the gems on the blade which I added once it was all painted). The orb on the end is a wooden sphere I had in the collection of weird wood bits i have in my stash. For the grip, I wanted to get the curved, round shape to the best of my ability, so I used some extra pieces of the foam pipe insulator tubes that I bought for his armor (the stuff I used for the raised/rounded edges) and cut them up a little more, then wrapped it with masking tape to squish the foam further into the size/shape I wanted. The tape is a little messy but it’ll be covered in a later step so it doesn’t really matter. The raised details are craft foam (the green section), cereal box cardboard (the flamey pattern at the base of the blade), and worbla scraps (the claw pieces around the sphere on the end of the hilt). With the build all done, a couple of coats of mod podge and some detail sanding, it was time for paint! As is my usual M.O. I spraued the metallic sections, starting with the gold. Once I had the gold sections finished and sealed with mod podge, I covered the hilt with a plastic grocery bag and sprayed the blade silver (I don’t have a photo of that step though). With that done, there was just some detail painting on the little flamey designs and the foam detail (that started out green but needed to be black). With that all done the last steps were adding the gems to the blade and wrapping the grip. For the grip I used stretchy vinyl that I happened to have sitting around (I think I got it on clearance a long while back and intended to use it for steampunk stuff… that obviously never happened lol). The vinyl is hot glued on, which I attached the start, and then glued in periodic spots as i wrapped the strip of vinyl. Here you can see the results of these last efforts. I am incredibly pleased with how this turned out, I’m pretty sure this is the best quality sword I’ve made yet, which is super exciting! The only detail left to share is the fully painted armor, which is now ready to go! With all of that done, there are only a few small details to finish before he’s con-ready! I still need to make his gloves and boot covers, his little purple pouch that he wears at his waist, and I need to find a workable belt. So with what’s left, he’ll definitely be coming to Tekko with me, as originally planned! That’s all for now, folks. I’ll have Jordan take a photo of me in all the bits once they’re finished. You can also continue to watch the other commission pieces I’ve been working on intermittently on Instagram to stay up-to-date, but I will make another post on here int he next week or so about those projects! Welcome back everyone! Sorry for the hiatus, but I’m currently smack in between two vending events so I’ve not been doing as much cosplay work to focus on having enough inventory for my shows! However, I have finished two major projects and I have some other stuff in the works and I’d like to share all that with you lovely people. First up we have the finished suit of armor that I’ve been working on! I’m super happy with how this guy turned out and I can’t wait to see Indi in it cause they’re gonna be such a wonderful Silas! My second finished project is the Dark Magician staff I’ve been working on for a long-time customer of mine! And yes, the orb on the end does in fact glow! I’m happy to have my first two commissions under my belt for the year and I look forward to seeing both of my customers’ full cosplays when they’re all put together! Next on the list I have some minor progress on my current personal project which you’ve already seen some work from. That would be Frog from Chrono Trigger, who I’m hoping to debut at Tekko in April. I already have the head 90% done (I just need to add a few small details like barbels and tympanum). so I started working on a few other bits. Thankfully the pants are just plain pants, but I needed a shirt that looks like his skin so I made one with the leftover fleece from the head so it would match. I did my best to show off all 3 colors here, since the front is all white and the back is all green. I’ve also started putting together his breastplate, which I’m making out of 3 different types of foam. The base is a large peice of EVA foam floor mat, with the weird texture facing the inside. The white bubbles are halves of styrofoam balls, and the rounded edge is part of those foam insulation tubes that you get to insulate pipes and things (you can find them at the hardware store. I also have some heavy-gauge galvanized wire on the inside to help it keep its shape since I don’t plan on putting worbla on the outside of this guy, I’m gonna try doing a plasti-dip coating instead. Unfortunately I can’t really do that until it gets a bit warmer, so this is about as far as that part’s gonna get for a bit. The last project I’ve started is a new commission from a friend of mine who’s a member of my steampunk group, the Cleveland Zeppelin Union. It’s not actually a steampunk project but it seemed like a good reason to plug our club. Anyway, it’s actually a project I’ve had before, but it’s been quite a few years since I had my first go at it. It’s Isabela’s necklace from Dragon Age 2. This was my first go at this project, which for reference is from 2014. It certainly doesn’t look terrible, but unfortunately my client wasn’t super happy with the way it fit so I ended up having to redo it. Regardless, I think this definitely shows how far I’ve come over the last 5 years. Between my familiarity with materials, my greater attention to detail, and just having a better feel for how to use what I have to make something look nice, this is going to be a major improvement over the foam pieces I made in 2014. Beyond that, I’ve been a lot more proactive with looking online to see if and how other cosplayers have made their stuff. Much like with constructing Frog’s head, I managed to find an awesome Isabela cosplayer who had a detailed description of how she made the jewelry (and the rest of her cosplay). So a big shout-out to Azzura on RPF for guiding me on this project! I obviously still have a good bit of work ahead of me, but I probably won’t be doing much more work on this stuff until after my second event (which is the first weekend on March). 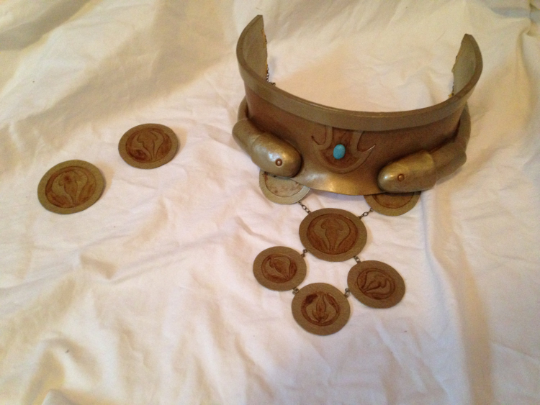 I may try to crank out Isabela’s necklace though, so I can get it to my friend sooner rather than later. So now that I have my first con of the year under my belt, commission season is open yet again, meaning that I’m going to be busy making a bunch of awesome stuff for great people! First up o the list is a project you’re all aware of already since I’ve been working no it off and on for quite some time now. It’s the 3rd set of Nohrian armor I’ve been tasked to construct, and this time it’s for Silas. I’ve shown you all progress photos of the build and now we’re into the finishing stages! Those of you familiar with my MO know that I generally try to spray the metallic bits when I can, as it’s a much faster and more consistent way to achieve an even color on them, so I sprayed the silver details on the pieces that have them. Normally for stuff like this, I’d do contour painting to make the shapes pop a bit more, but that’s really hard to achieve when the surfaces are black, because despite what Sterling Archer might tell you, there’s no "slightly darker black” to use for shading, and it looks grey instead of black if you do too much highlighting. So I took my opportunities where I could and did some shading on the silver bits, where appropriate. As per usual, the whole armor set is getting a top coat of matte mod podge to give it some moderate sheen and help protect the paint. I’ll also be using it for the back to seal the foam and make sure the silver overspray on the undersides doesn’t get on Indi’s cosplay. There’s only a few bits left to do, mostly put together the pieces for the boots and seal the exposed foam on the undersides of all the pieces, so I’m glad to be nearly finished with this big project! The second project I’ve been actively working on is a dark magician staff from Yu-gi-oh. A great big shout-out goes to Giant Dad for his continued support and business. He’s commissioned a number of things from me including the Fat Man from Fallout, and the Zweihander from Dark Souls. This latest project is only getting started but I’m hoping to crank it out in the next couple of weeks. You also may have noticed that the shaft of the staff is in fact a broom handle, you know how much I love using random junk in my props! And it works particularly well because it’s hollow so the light that illuminates the ball on the end fits nicely into it. You’ll be seeing more progress on this over the coming weeks. The last project I’m actively working on is a personal one, that I’m hoping to have done for Tekko in April. If you know me you probably know I have a love of amphibians so I’m particularly excited to be cosplaying one of my favorite anuran characters: Frog from Chrono Trigger. I’m pretty sure I posted a few photos from my early construction of his head, but we’re gonna do it again anyway cause I can’t remember for sure. I did some research on furries for this project, because it seemed to make the most sense to me to construct the head the way they do, and I was fortunate to find some WIP photos from Tionniel on dA of how they constructed it so I had some good guidance. I decided to cover the head with fleece, mostly for the sake of simplicity, and the face that it would be easily correctable if I messed anything up. Unfortunately, I didn’t have the foresight to trace the foam pieces before I put them together so that I had an accurate pattern for the fleece cover… so I had to eyeball it a bit. Thankfully, the fleece is pretty forgiving, though there are a few big folds in the back that… just have to be there lol. As you can see from the photo here, the nose is my only way to see (though you’ll see later that I have a second option). The eyes are the two halves of one of those big, clear, plastic ornaments. I used contact adhesive to attach the ring of green fleece around the base so they could be stitched onto the head. You might also notice that there’s pieces of masking tape on the eyes, that was to give myself a guide for painting the pupils. I wanted to paint the eyes on the inside of the baubles to they stayed nice and glossy, and to protect the paint from getting scratched as I continued to work on it, and of course later when it’s actually being worn. So since the layer against the plastic is the one you’re going to see, I started with the pupils and worked out from there. They’re not actually attached in the photo above yet, they’re just pinned into place so I could make sure the eyes weren’t gonna be looking in weird directions. So now the eyes are done and attached! And the nose is fixed too, so it doesn’t look all janky any more. The last bit I’ve done with the head is the eyelids, which is more bits of upholstery foam with fleece around it. With that detail finished the only thing left are the tympanum (frog ears), which should be pretty easy. That’s all for this week! I have a handfull of other new commissions in my queue so as soon as that armor is done (which I’m hoping to finish ASAP) you’ll be seeing some more new projects coming together, so don’t forget to check back! And also another friendly reminder that I am most consistent with posting WIP potos on my instagram, @mikeydoescosplay, so feel free to give me a follow to stay up-to-date!